NEW YORK TIMES BESTSELLER WALL STREET JOURNAL BESTSELLER One of America’s most accomplished entrepreneurs—a pioneer who made the Internet part of everyday life and orchestrated the largest merger in the history of business—shares a roadmap for how anyone can succeed in a world of rapidly changing technology. Steve Case’s career began when he cofounded America Online (AOL) in 1985. At the time, only three percent of Americans were online. It took a decade for AOL to achieve mainstream success, and there were many near-death experiences and back-to-the-wall pivots. AOL became the top performing company of the 1990s, and at its peak more than half of all consumer Internet traffic in the United States ran through the service. After Case engineered AOL’s merger with Time Warner and he became Chairman of the combined business, Case oversaw the biggest media and communications empire in the world. In The Third Wave, which pays homage to the work of the futurist Alvin Toffler (from whom Case has borrowed the title, and whose work inspired him as a young man), Case takes us behind the scenes of some of the most consequential and riveting business decisions of our time while offering illuminating insights from decades of working as an entrepreneur, an investor, a philanthropist, and an advocate for sensible bipartisan policies. We are entering, as Case explains, a new paradigm called the “Third Wave” of the Internet. The first wave saw AOL and other companies lay the foundation for consumers to connect to the Internet. The second wave saw companies like Google and Facebook build on top of the Internet to create search and social networking capabilities, while apps like Snapchat and Instagram leverage the smartphone revolution. 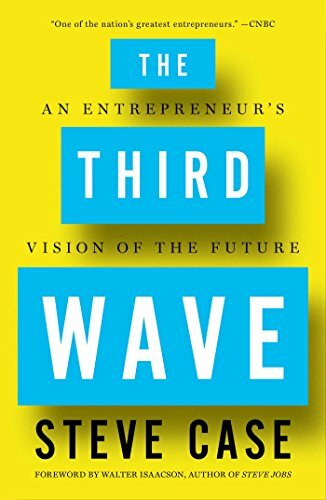 Now, Case argues, we’re entering the Third Wave: a period in which entrepreneurs will vastly transform major “real world” sectors like health, education, transportation, energy, and food—and in the process change the way we live our daily lives. But success in the Third Wave will require a different skill set, and Case outlines the path forward. The Third Wave is part memoir, part manifesto, and part playbook for the future. With passion and clarity, Case explains the ways in which newly emerging technology companies (a growing number of which, he argues, will not be based in Silicon Valley) will have to rethink their relationships with customers, with competitors, and with governments; and offers advice for how entrepreneurs can make winning business decisions and strategies—and how all of us can make sense of this changing digital age.